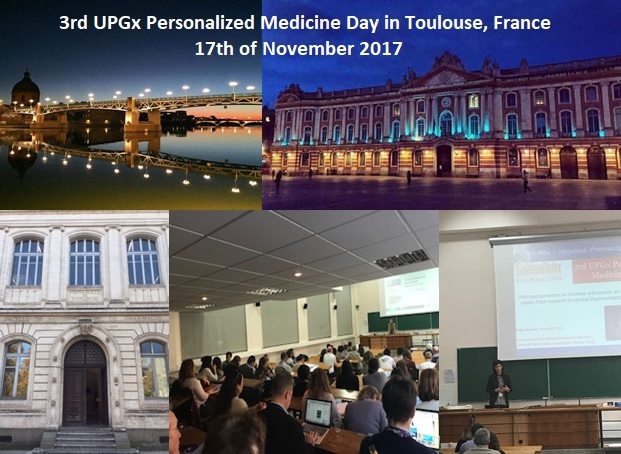 The 3rd U-PGx Personalized Medicine Day in Toulouse was successfully organized and completed on 17th November 2017 with the theme ”Pharmacogenomics in Oncology: Deciphering the Ethical, Legal and Societal Issues”. The meeting was co-organized by the Golden Helix Foundation and the University of Toulouse, which both are partners of the Ubiquitous Pharmacogenomics (U-PGx) project, funded by the European Commission (H2020-668353). This conference is labeled as part of the European Science Open Forum (ESOF) 2018 Toulouse. It was an international open event for clinical pharmacologists, hospital pharmacists, general pharmacists, specialists, general practitioners, medical students, laboratory technicians, regulators, healthcare insurers and others interested in pharmacogenomics. Several partners of the U-PGx project gave lectures, such as Prof. Anne Cambon-Thomsen; University of Toulouse, France, who gave the keynote lecture, Dr. James Buchanan; University of Oxford, UK, Prof. Ingolf Cascorbi; University of Kiel, Germany, Dr. Erika Cecchin; Cancer Research Organization, Aviano, Italy, Dr. Heidi Howard; Center for Research Ethics and Bioethics, Uppsala, Sweden, Dr. Sandrine de Montgolfier; University of Toulouse, France, Prof. George P. Patrinos; University of Patras, Greece, Dr. Emmanuelle Rial-Sebbag; University of Toulouse, France, Dr. Fabienne Thomas-Jean; University of Toulouse, France. The conference had a high overall impact to all participants. Both visitors and speakers had the opportunity to discuss and exchange their point of views regarding the ethical, legal and societal issues of pharmacogenomics in Oncology. We thank all the delegates for their participation at the 3rd U-PGx Personalized Medicine Day. We are looking forward to welcoming you at the 1st U-PGx Personalized Medicine Public Day, on 6th December 2017, in London, U.K.
← First 1,000 patients enrolled!